Ready to be a hero and slay some dragons? A typical floral oriental design is used for the background of Dragon Reels but that’s where the sweetness ends as fire breathing dragons burst into view under the orders of their evil Dragon Master who is determined to defeat your attempts to free the Chinese Princess who is being held at ransom – but do you have what it takes to overcome them and receive a huge reward for doing so? Dragons are legendary creatures in Chinese mythology and have been subject of many online slot machines, but Euro Games Technology have done an amazing job creating a fantasy adventure for you to go on with stunning symbols, dramatic animations when you land winning combinations, a maximum possible win of 100,000 coins, a free spins mode, plus a gamble mode and the Jackpot Cards feature for a very fiery experience! Boasting a high return to player percentage of 96.44%, the Dragon Reels slot machine is played across 5 reels and 25 paylines (although you can adjust the number of paylines to your own preference with 20, 10, 5 or 1 also available to choose from) with generous staking options of 25, 50, 125, 250 or 500 available making it suitable for everyone! Can You Master the Dragons? You’ll have to slay the Dragon Master and tame the fiery dragons if you want to escape from their lair and successfully rescue the beautiful Chinese Princess, with the storyline perfectly captured by the stunning oriental design of the thirteen symbols that feature in Dragon Reels. The most impressive, and highest paying, of these is the Wild Dragon depicted in an assortment of colour flashing its razor sharp teeth as it guards the Princess from you. The Wild Dragon can pop up on any of the reels and typical rules of a Wild symbol apply as it can substitute for all symbols except for the Scatter symbol, plus when it is part of a winning combination you’ll witness it breath fire before fireworks explode. The Scatter is also very impressive, represented by a Chinese Dragon symbol on top of the instantly recognisable Yin Yang (the two halves together representing wholeness) and this not only pays out the second highest payout available (100x your stake for five on a line), it’s the only symbol to pay out for two on a payline (2x your stake) rather than requiring a minimum of three. Defeating the evil Dragon Master will see you rewarded with up to 40x your stake, while freeing the Princess will see you rewarded with up to 30x your stake, but that’s not all you will encounter in this epic fantasy adventure. The path to the dragon’s lair will be lit up by Chinese lanterns, drums will be beat as the action heats up, fireworks will explode in celebration of your victory, plus Ace to 9 playing card symbols (which I’d prefer were kept to online video poker machines) also feature in an oriental design. While encountering a fire breathing dragon may be a terrifying thought for many of you, you’ll actually be greeting them with open arms in the Dragons Reels slot machine – in fact, the more the merrier! Each and every time you land three or more of the Scattered Dragon symbols you’ll trigger the fiery free spins mode which is played on another set of reels (so that it’s obvious to you that you’re in free spins mode and not the base game) and sees you rewarded with 10 free spins that have a 2x multiplier attached to make your wins even greater. 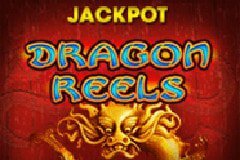 Dragon Reels is the latest in a long line of online slots based on dragons, following on from the likes of Aristocrat’s 50 Dragons and Mazooma’s Dragon’s Wild Fire but it is certainly a very exciting slot which offers big rewards that make it well worth risking entering the dragons den. It boasts a stunning oriental design and you’ll love the animations like when the Wild Dragon breaths fire before fireworks explode. However, it’s the free spins mode that you’ll love the most as this is where the biggest wins come from in Dragon Reels with an initial ten free spins rewarded with a 2x multiplier attached, plus the ability to retrigger additional free spins. Become a hero and spin the reels to slay the dragons and rescue the Princess for a big reward now!